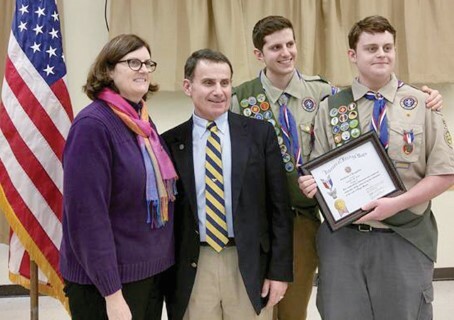 The Windham Eagle News: Gardner Reed was awarded Boy Scouts highest honor last Sunday at the Windham Veterans Center. Gardner Reed was awarded Boy Scouts highest honor last Sunday at the Windham Veterans Center. Reed, a senior at Windham High School, was presented with his Eagle Award at a ceremony with his family and friends present. Reed is a member of Windham’s Troop 51 under the direction of Larry Cole. For his Eagle project, Reed interviewed six VFW members about their military experience and captured it on film for the VFW Post. For those veterans who wanted he sent their film to the Library of Congress' Veterans History Project. He interviewed five men and one woman, who served in wars in Korea, Vietnam and both Gulf Wars.